The dramatic recent advances and emergent trends in technologies have brought to the fore many vital and challenging questions and dilemmas for leaders and organizations. These are issues that call for a critical, insightful examination of key questions such as: are modern technologies beneficial or problematic for the well-being of individuals, organizations, and societies at large; why do we seem to feel more disconnected in an age of technological connectivity; can organizations reduce technology-induced stresses and find ways to enable the mindful use of technologies and how can organizations, governments and societies manage the use of technologies wisely? Such questions, when explored from various perspectives of wisdom, can yield significant insights, increase awareness of the issues, deepen the dialogue and help redesign an increasingly technology-driven future. However, there is little researched published material available on such questions and issues. 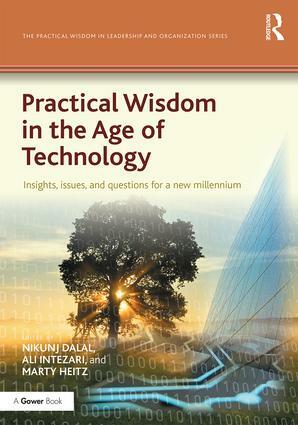 Practical Wisdom in the Age of Technology: Insights, Issues and Questions for a New Millennium will provide a space to engage in thought-provoking dialogue and critical reflection on a variety of themes linking technology and practical wisdom. It will offer a foundation for exploration, inquiry, engagement, and discussion among organizational, political and social leaders, technology professionals, information systems academicians, wisdom researchers, managers, philosophers of technology, and other practitioners. 9. The Human–Computer Relationship: Who Shall Survive? 11. Can Scientific Method Help Us Create a Wiser World? Nikunj Dalal is Professor of Information Systems in the Spears School of Business at Oklahoma State University, Stillwater, USA. His research relates to technology and its relationship to: wisdom, mindfulness, learning, dialogue, and philosophy, as elements of an integral inquiry of the human condition. Ali Intezari is a Lecturer of Management and Leadership in the UQ Business School at The University of Queensland, Brisbane, Australia. His current research includes wisdom theory, management decision-making, and knowledge management. He has published in the fields of management and information systems. Marty H. Heitz is Associate Professor of Philosophy at Oklahoma State University, Stillwater, USA. His research includes Chinese and Indian Philosophy, non-duality, existential phenomenology (especially the thought of Martin Heidegger), and the thought of David Bohm.